This is a Art Nouveau period French advertising poster for the lottery in 1909. It benefits the retirement home of singers, authorized by the ministerial order on April 18, 1909. This wonderful piece of history features a dynamic image of a young lady pointing off into the distance, looking down at a seated older man on the left hand side of the poster. 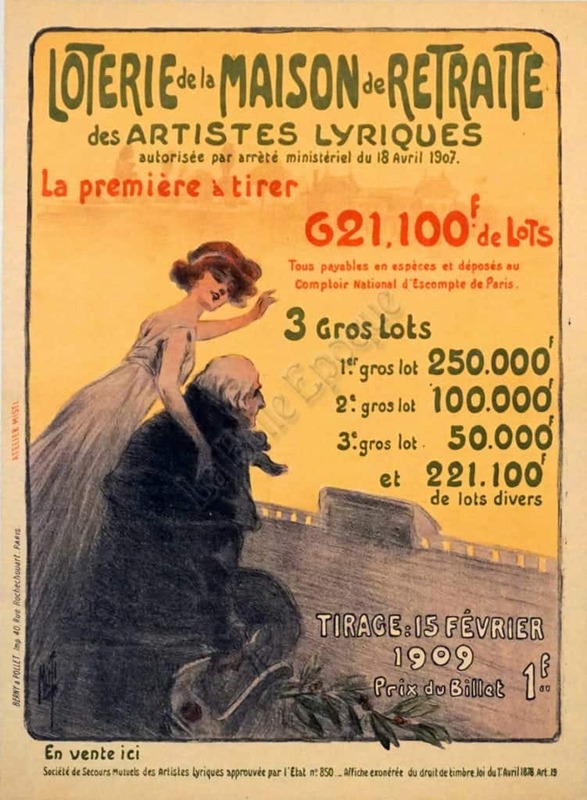 Elegant text composes the top and right hand sides of the poster, providing information about the lottery. The typography style, combined with the soft image, creates an archetypal informative advertisement from the Art Nouveau period in France. This poster was printed by Berny & Pollet 40 Rue Rochechouart. Paris; Atelier Misti, 1909.